I have been experimenting with painting first and adding line second, instead of the reverse. It makes me look at the big shapes and as well, it forces me to determine what areas I want to keep light and which areas should be dark. Of course after I draw in some lines I always need to go back to add a second wash in the really dark areas. What I like the best about this method of working is the little offsets that happen because the painting is not that accurate — in this case the parts of the porch roof that don’t quite meet up. When it’s really cold out (and you are not in your car) you have to work FAST, before your fingers freeze. I have tried drawing with gloves on but that just doesn’t work for me (although I have yet to try the ones with the finger tips cut off). The view down rue Pontiac, in the Plateau Mont-Royal district, is full of great shapes and colours but I was sitting on some cold concrete steps so I did this pretty quickly and then made a beeline for a warm café. For the last year I have been using my car and the kitchen counter as my studio but thanks to a little bit of juggling in my house I now have a studio to work in, and that makes me pretty happy. I also have an amazing drafting table to use, with a two-inch thick wood top and a surface that is almost six feet wide. Plenty of room on there to paint — even full sheets if I choose — and place to leave my work-in-progress. 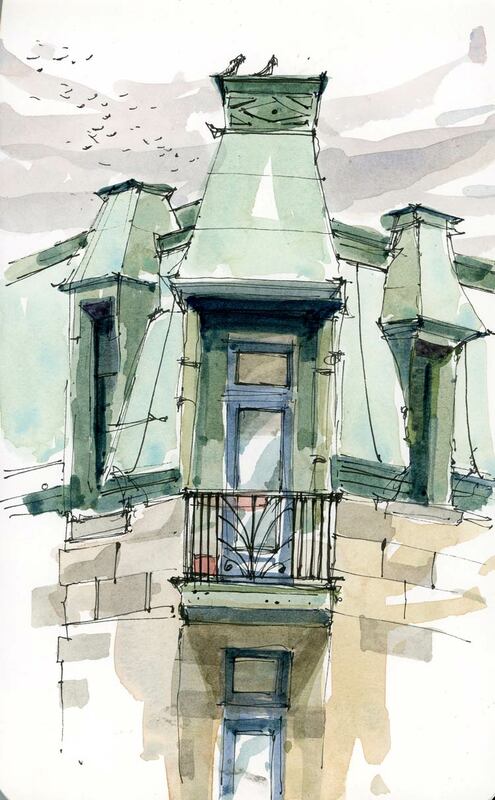 This sketch of the balcony on avenue Mont-Royal was done on location but I added the finishing touches at home, just to try out the new space. Mont Royal is a hill in the middle of the island of Montreal, but Montrealers call it “the mountain”. We go for picnics on the mountain, we have scenic lookouts on the mountain and we have a big greenspace on the mountain designed by Frederic Law Olmstead. And we love our “mountain” because when we have been away, we always know we are close to home when we see its distinctive shape as we approach the city. We also have a street called Mont-Royal that faces the “mountain” and that was the destination for the second outing of Urban Sketchers Montreal. Marc Holmes and I were pretty happy to have 15 people turn out on this cold morning — a few who even came from Ontario for the event! Some of the people knew each other from a Sketchcrawl group so it was great that we found each other. 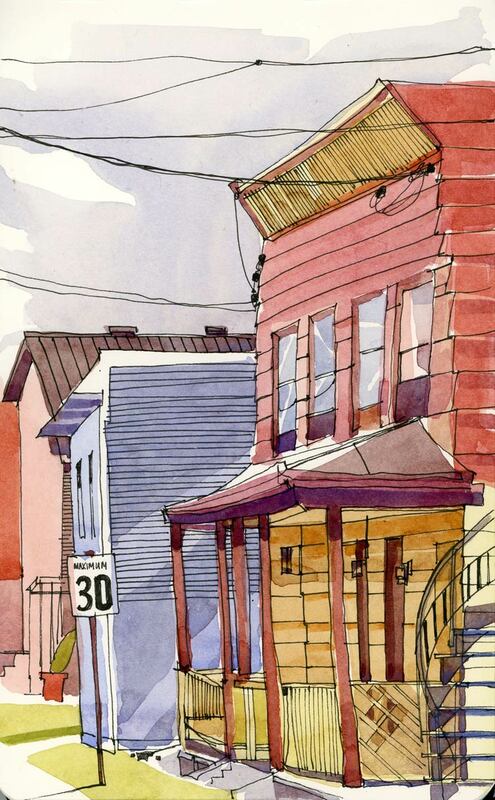 We sketched the Victorian houses and the back alleys up and down the avenue, stopping to warm up in cafés at lunch and at the end of the day. Seems to me that USK Montreal is going to keep on growing. Not much time to paint today. Not much time to write today. 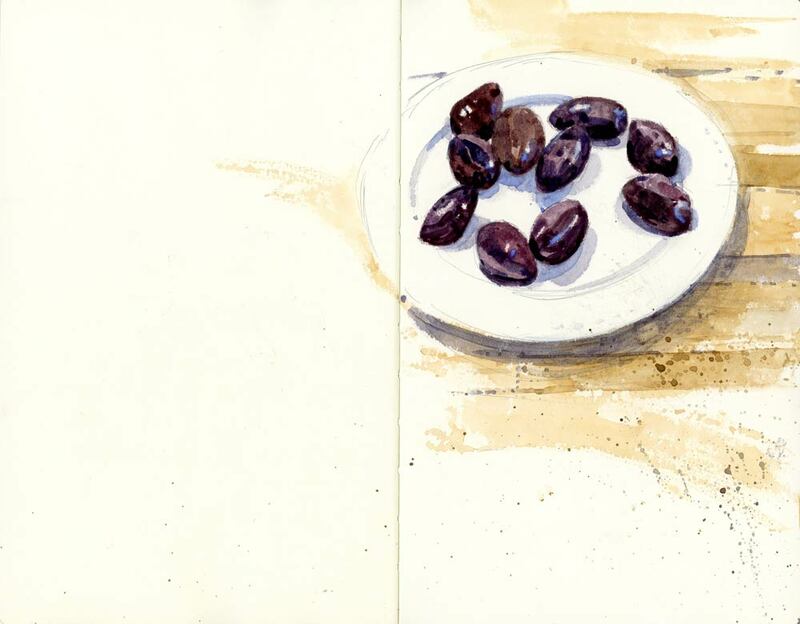 Just enough time to sketch a few olives on a plate while getting dinner ready. Indian Summer is a heat wave that occurs in the autumn, or so says Wikipedia. The weatherman on my local radio station says that for it to be a real Indian Summer we have to have three days in a row of hot weather. The other defining quality of these type of autumn days is a haze that seems to soften and mute all the colours. Well I think there may be a storm coming my way tomorrow but I know that today is Indian Summer for me, and for all the people who were out along the canal in Lachine — riding bikes, walking dogs, catching some rays and having lunch on terraces. 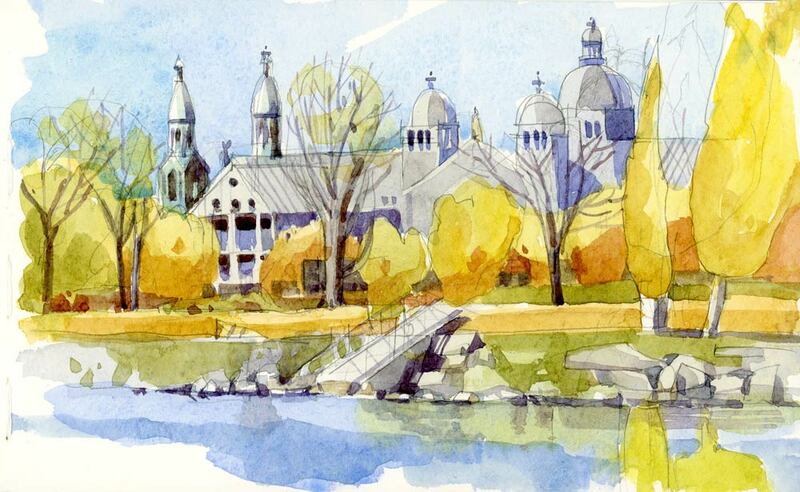 I sketched this from Parc René-Lévesque looking across the canal at Église Saints-Anges Gardiens and the domes of College Sainte-Anne. 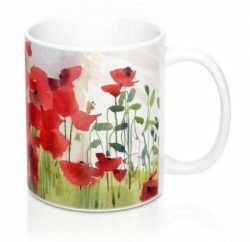 Last summer I tried a Derwent Inktense pencil for a small sketch that I was doing in a workshop. I loved the inky black that I could obtain with it, but the pencil I tried was borrowed and I haven’t been able to find it until today. This was done in my watercolour Moleskine with the water-soluble Inktense in Charcoal grey and also a water-soluble graphite pencil in some of the lighter areas. Still loving how dark you can get with this when you add water. 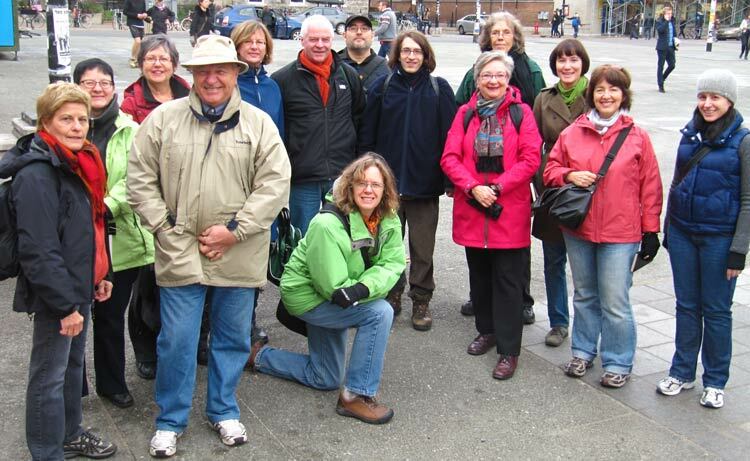 This coming Sunday, October 28, is the monthly outing for Urban Sketchers Montreal. 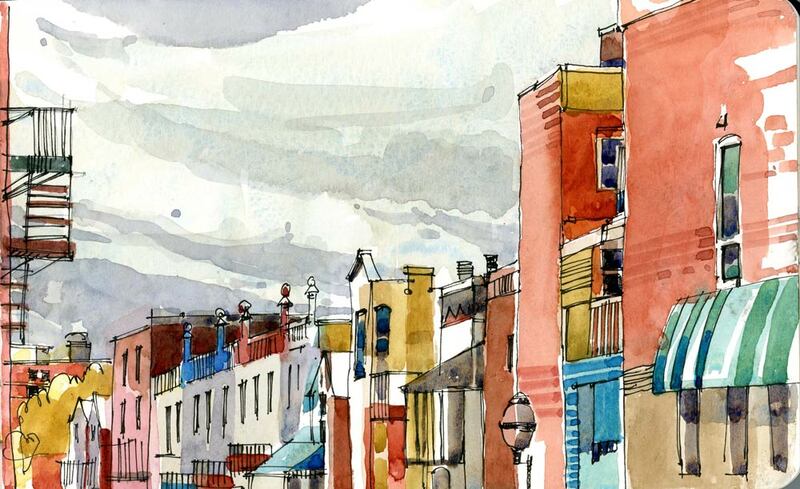 We’re going to be trying something new this month: a sketchcrawl on avenue Mont-Royal (because the weather is looking kind of cold and possibly rainy). The plan is to meet at the Mont-Royal metro station (upstairs, not on the platform) at 10 am. We’ll spread out a bit, sketching indoor or out, going in and out of shops and cafés to sketch, and then meet at the end to have a look at everyone’s sketches and warm up somewhere. Mont-Royal is a really interesting street with lots of unusual shops on either side and a great view of the mountain. 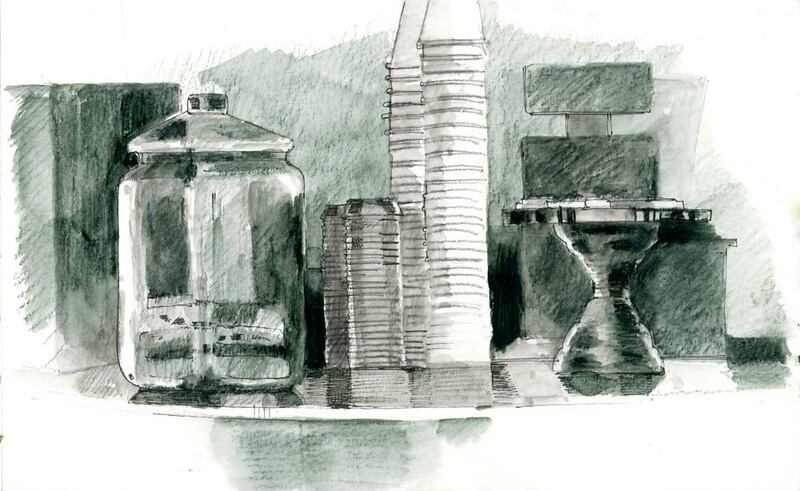 Everyone is welcome to join us for a day of sketching and meeting new people. If you are interested in adding your name to the mailing list for this or future events please email me at sblaukopf (at) gmail (dot) com.